He’s on the Move (a post by Josh) – Eat Me. Drink Me. It’s been a minute since I’ve updated my travels, my eats, and frankly, my stomach’s adjustment to Southern Foods. Don’t get me wrong, I’ve been living in the South for about three years now, but I don’t always choose to indulge in collards with fat back as my staple lunch item. 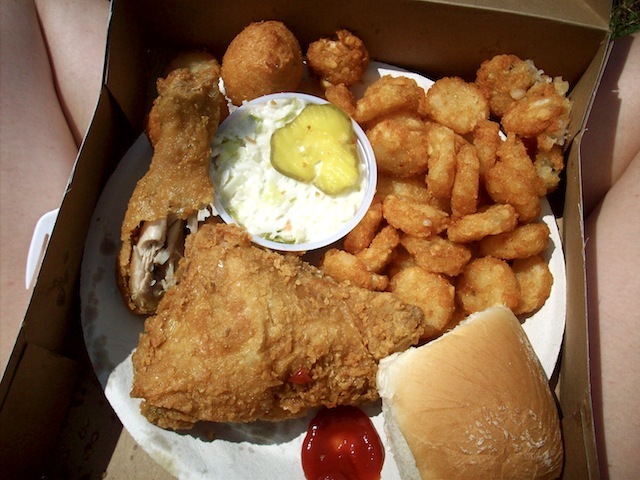 But now – this summer – I’ve got to go big then go home and take a nap to “work off” that fried goodness. O! that fried goodness! Well since I’ve last updated (on my travels, not my shameful meal), I’ve been to Sapelo Island, Charleston, a few surrounding areas (James Island, Mt. Pleasant), Beaufort, Athens, Atlanta, Watkinsville, and Birmingham. That’s where I sit right now, sipping a well roasted, full bodied black coffee – iced (to cut the 99 degree heat and 110 percent humidity). With a list like that, I’ve had my share of experiences in different parts of the country. A few come to mind immediately. Like the time in Beaufort, SC where a man walked away from me after this conversation: “Where ya from” – “Well I was born in Virginia, lived in New York -” “Goodbye.” I kid you not. He didn’t even hear that I live in North Carolina now (clearly below that Mason-Dixon line). But more than anything, my food experiences have been out of this world. And with that, I bring you two excerpts from my 26 days of travel (so far): one international delight and one stomach stuffing, sweet-tooth filling meal with eight perfect strangers. At first I was a little hesitant to go to Atlanta. I mean, let’s face it – Atlanta is so internationally citified that traditional culture is hard to come by. Yes, you have the history of the Tea Rooms and the three P’s of Georgia (Pecans, Peaches and Peanuts). But overall, it is a melting pot of many nations, peoples and traditions. Don’t get me wrong here – I loved Atlanta as a destination for vacation, it was just that research was hard to come by. Was that a bad thing? Not at all. A couple days of rest is always a good thing. While I was in Atlanta, I was staying with a good friend over in Stone Mountain. This town’s limits stretch far beyond the giant Stone Mountain that crops up out of nowhere and the historic town that lies at its feet. One of the better parts of staying at Stone Mountain though, was that the town butted up against Dekalb, the home of a giant international farmer’s market. This isn’t a farmer’s market like any other. It isn’t outside. It isn’t 8am to 12noon. It isn’t just what is in season in the area. Dekalb Farmer’s Market, the DFM, or as some locals call it, “Farmers,” is a giant warehouse full of spices, fruits, vegetables, sauces, beers, wines, fish, dairy, meats, breads, noodles, rices and people from all over the world. Next to Mexico: Mangos you find Haiti: Mangos and Jamaica: Sugar Cane. You find Greek, Italian and Spanish olive oils sitting side by side. And the people that work there wear a name tag to not only tell you their name, but what languages they speak (Pashto, Urdu, Spanish, Hindi, German…). This may sound like a grocery store, but the difference is that the food comes straight from the farmers. There is no middle-man, so the foods are fresh, un-tampered with, and on the cheap. I, needless to say, spent about three hours in this warehouse looking at every nook and cranny trying to find the best deals or the newest fruits or the strangest herb that I could possibly cook with. A friend and I had our hearts set on $2.75 per pound crawfish for a creole boil, but we remembered last minute that we didn’t have the equipment for the endeavor. So we settled on an Indian curry with fresh spices, paneer, two pounds of spinach and a whole lot of mustard seeds. Now, just to give you all a sense of how amazing the spices collection is, I think I can honestly say that I bought about twenty different spices worth about $100 for a mere $33. That includes three loose-leaf teas at about the price of one cup of tea at a coffee house: $1.50. There, I’m done bragging about my amazing finds. I think the friends I was staying with got enough of my elation for a while too. But they did manage to stomach the boasting after Alex (a good friend also visiting) and I cooked up a feast fit for twenty people – tomato and okra medley, spinach paneer curry, rice seasoned with browned cumin, and a bay leaf, lime-based scallop dish that made even the spicy food lovers (me) sweat. After about two hours of prep and cooking, we sat down around the dining room table each equipped with a towel to wipe the sweat away, and dug in. It was delicious; the meal was a break from the normal Southern supper. It did my mental health good. I remembered again that there are spices out there that can awaken even the most hibernated taste bud. This is on a side note, but it is something that you must know: put down those wine glasses when you’re trudging (happily) through a spicy meal. Yes, yes, I know that you’re supposed to have a Reisling, or some other dry white to enhance or cut the spice. But, frankly, that’s wrong. Try this next time: an IPA (or Indian Pale Ale). As we were slurping down the curry and sloshing off the forehead sweat, we were also sipping heavily on Dogfish Head’s 60 minute IPA. 60 minutes because it is brewed for that long. An IPA, as Bon Appetit recently told me, is a hoppier beer whose popularity is growing rapidly. Bon Appetit also confirmed that IPAs work splendidly with hot meals such as “Thai, Mexican, Chinese, and Cajun food” (Bon Appetit, July 2009, page 47). How perfect. I guess that leads me into a nice segue (if you don’t mind my pointing out the obvious). A segue, that is, from Atlanta to beer to Cajun foods. Why Cajun foods? Well, because that’s where I head next. I’ll be making my way now from Birmingham to Oxford, Mississippi to New Orleans with a few stops along the way. Love Indian food so will try the beer.